Home Health Treatment for Burns – How to heal Burn Wounds? Burn injuries can be very painful. Burns are characterized by inflammation, fluid accumulation and severe skin damage around the wound. Exposure to fires, flames, sun rays, electricity, hot steam, boiling liquids, tar, chemicals, and other hot objects are common causes of burns. Doctors evaluate severity of burns depending on depth of the burns and size of skin area affected by burns. First-degree burns: This is the lowest level of the burn wound because it only affects the upper layer of the skin called the epidermis. It can cause swelling and redness around the burn area. Mild sunburns for example are first degree burns and can be easily treated at home. Second-degree burns: This type of burns can cause severe swelling, pain and blisters as it penetrates the second layer of skin, called the dermis. Second degree burns can take upto 1 to 3 weeks to heal. These burns can cause the skin to get discolored but raised scars do not common occur. Third-degree burns: Third degree burns damages bones, muscles and inner tissues. Burn injury feels leathery and skin looks white, black, and/or grey. Third degree burns are not painful because the nerve endings under the skin that transmit pain signals to brain are destroyed. When a burn is reached to this level of severity, medical treatment is the necessity. Proper and immediate treatment is required due to high risk of infection. Third degree burns are usually treated with skin grafts and takes months to heal. Raised scars can be observed once the burn wound has healed. These type of burns causes swelling and redness in and around the skin and can be treated naturally at home. The swelling can cause pain but most of the time it is self-treatable by the body within a week. But if the affected area is large then medical help may be required. 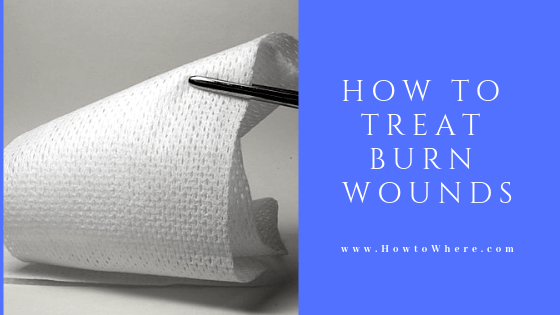 How to treat first degree burns? Hold the burnt area of the body in cool running water for 5-10 minutes and then wash the affected area by soap. Do not use ice or very cold water. Take acetaminophen or ibuprofen to relieve pain or apply aloe vera gel on the burn to soften the skin. Use antibiotic creams to protect the burn from bacterial infection. Cover the area with sterile, non-adhesive gauze bandage. Do not use cotton balls on the wound as they might stick to burnt skin and cause infection. Do not consider using oil, eggs and butter as there is no strong evidence to prove that these substances heal the burns. These substances can even cause infection. Second-degree burns are far more dangerous than the first degree wounds as they affect the top layer of the skin as well as the layers below it. These type of burns causes blisters and some of those blisters may pop which may give the skin an ugly and painful look. Over time these blisters may cause severe infections on the skin. To prevent infections regular care of the wound should be taken. The affected area should be treated gently and cleaned regularly. The bigger the blisters are, the longer the burn will take time to heal. Usually, these blisters take 2-3 weeks to heal. How to treat second degree burns? Run water on the burn regularly for about 15-20 minutes, this will help to relieve pain and will reduce the chances of infections. Take pain reducing antibiotics which will also help to reduce chances of infection. Apply antibiotic cream to blisters to reduce the chances of infection. Apply wound dressings and regularly change the dressings to quickly heal the wound. If the burn is on joints or on another sensitive body part, then go to a medical specialist immediately otherwise it may increase the chances of infection. Third-degree burns are one of the most dangerous burns. This type of burn is also called full thickness burn. In this case, many layers of the skin, bones, muscles, tissues and blood vessels are destroyed. Never try to heal a third-degree wound on your own, call the nearest medical help available in your region. To protect the wound from injury, never leave the wound open and make sure no unwanted clothing is stuck to the wound. These burns can become a cause of death because they can cause many infections and blood loss. In the case of third degree wounds, the body becomes inferior to tetanus. How to treat third degree burns? Third degree burns are treated with skin grafts surgery in which dead skin is removed and replaced with healthy skin from another part of the body. The grafted skin is then treated with antibiotic ointment and non-stick wound dressings. Burn care or treatment requires the use of specialized medical products that help in covering the wound and aiding in the healing process. Silver dressings, Hydrocolloid dressings and hydrogel dressings are one of the most commonly used dressings for burn wounds. They help keep the burn site free from moisture and bacteria. This prevents the growth of bacteria and speeds up the process of recovery. Sterile gauze can be applied to minor first degree wounds. Gauze dressings that includes hydrogel can prevent infection and heal the burn. Silver dressings prevent bacteria growth and fasten burn wound healing. Non-adherent or non-stick dressings employ a soft silicone that covers the wound without sticking to it. This property of wound dressing minimize the pain and discomfort associated with dressing changes especially for burn wounds. The moist layer of a silver-based cream keeps the wound moist and promote healing. How to prevent infections from burn injury? Do not cough or sneeze directly on the open wound as it will transfer different types of bacterial species from your mouth. Do not leave the wound open, cover it with a proper bandage as it will protect the wound from the atmospherical infections. Make sure that no unwanted clothing is stuck on the wound. Do not peel off the dead skin from the wound as it will increase the chances of infection. Next articleWhat To Do If You Are In a Toxic Relationship?